Earlier this spring, I traveled to central Arizona to investigate the illegal poaching of saguaro cacti for Red Bull's Terra Mater magazine. The National Park Service recently began tagging saguaro cacti in order to prevent theft - which is primarily tied to housing development in the region. However, saguaro cacti are often harvested for landscaping beyond the region bound for California or even China. The state requires that transplanted cacti be tagged. The only exception to this is if a private land owner is merely relocating one within their own property. We weren't able to connect with any subjects who illegally harvested. To strengthen the story visually, I looked at how saguaros were represented in the landscape, from wild plants on national forest land and in Saguaro National Park to residential applications in old trailer parks and million dollar homes as well as roadside plantings by the Arizona Department of Transportation. I Love Texas Photo just posted an interview that I did with them a few weeks ago. In it I get to speak about my personal work, career trajectory, and recent feature for The Nature Conservancy on the Edwards Aquifer. 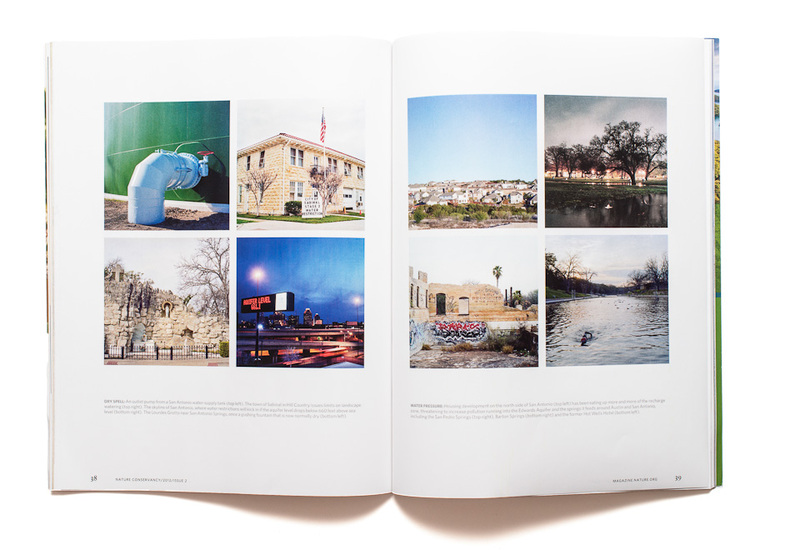 I Love Texas Photo features work from Texas-based photographers and was created by Jasmine Defore who previously worked at Redux. Sarah Lim conducted the interview. Thanks to both of them. I story I worked on in the spring about the Altamaha River in Georgia was recently published by The Nature Conservancy. The deadline was tighter with this story than with Water Works and a recent drought in Georgia meant the water levels were against us, but I was still came away with some strong images. The Altamaha River delta was extremely visual from the air. I was really honored to work on a story celebrating wildness in my home state. I got a hold of the latest Nature Conservancy magazine and got see our feature story on the Edwards Aquifer in print. It was a fantastic assignment to get back on the ground and do an in depth environment assignment in Central Texas as I recently moved to Colorado. The region holds a special place in my heart and the challenge of photographing the Edwards Aquifer - an environment system that is underground and essentially invisible - was an enjoyable challenge. Everyone worked real hard throughout the project and it was really enjoyable to collaborate with the design team on the layout. I'm very humbled (and pleased) that the images were given such space and weight in the magazine. The piece is 16 pages (w/ 5 spreads of just images) and a cover. The rest of the online piece can be found here. Earlier in the year, I had a fantastic assignment from The Nature Conservancy to create photographs for a story on the Edwards Aquifer in Central Texas. 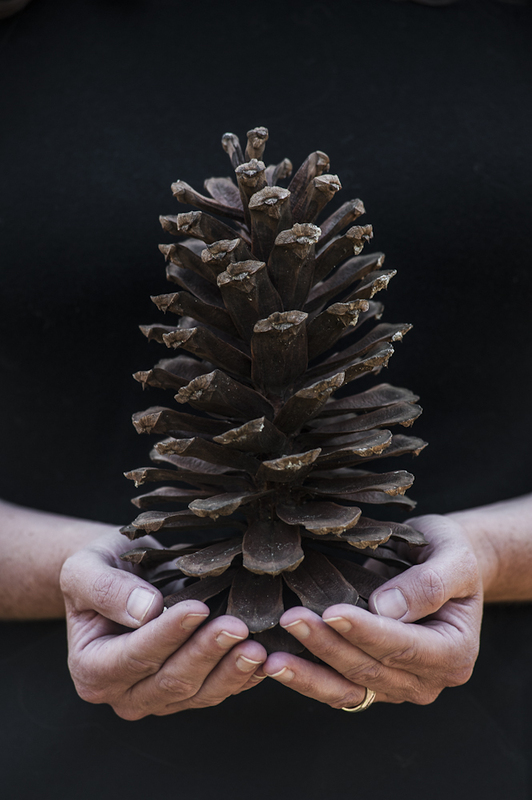 Not only was this a relevant land-based story in Texas during a time of critical drought, but the photo editor, Melissa Ryan, came to me interested in a more artistic interpretation of the subject. With the welcomed creative freedom comes the responsibility of producing something unique with finite resources. Exploring the relationship between landscape and culture is central to my personal research and I was thrilled at the opportunity to utilize that way of seeing for a client. On my end, that involves quite a bit of exploring and looking for subtle moments in the interaction between people and place that speak of our larger condition. The story was shot on film with a Hasselblad and a single 80mm lens. The square format is atypical for magazine work, but gave the images the sense of a formal documentation that we were looking for. The design team did a great job of maintaining the strength of the images through a consistent pacing in the layout. Exploration and constant refinement to the point of exhaustion are certainly a part of my process with personal work and I am very grateful that the rest of the team worked so hard to create something beyond a typical editorial assignment. See a video about the process HERE. http://vimeo.com/14680989 I shot a story for National Parks Conservation Association (NPCA) on the Valles Caldera National Preserve in New Mexico earlier this summer, capturing both stills and video/interview material. I enjoyed working on a larger, collaborative editorial project with a process that everyone was exploring. I worked with Jason Bosch at Aurora Novus, the multimedia production arm of my agency, Aurora Photos to produce the video under the guidance of Amy Marquis, associate editor at the magazine. This parcel of land is, of course, quite stunning, but also has an interesting cultural history behind it. It's been logged and mined, though mostly used as ranch land for the past hundred or so years. It's mild summer climate and situation at the headwaters of the Jemez River make it an ideal summer habitat for many animals. It shifted from private to public ownership and has been in an interim management policy, though is now in the process of coming under National Park Service management, though is likely to remain under the 'preserve' model. As serene as the caldera is, my time there was definitely focused on making work. I was fortunate enough to catch an incredible evening of weather. It always strikes me at how wonderful and amazing "bad" weather is. I was interviewed by photo editor Paola Brivio of the Italian magazine GEO to profile my Reality TV project in their July 2010 issue. Paola questions were very insightful and wove through several ideas my work. I've included a copy of the interview here. On Sunday, I finished backpacking 50+ miles from rim-to-rim-to-rim in the Grand Canyon with Boy Scout Troop 65 from Wooddale, IL. The Grand Canyon trip is a staple for the troop and they've done the trip about 9 times - roughly every 5 years. It was a fantastic assignment from Boys' Life magazine, an official publication put out by the Boy Scouts of America. I hiked with 6 fourteen year olds and 4 adults. We spend two nights in the canyon each way with a rest day in the middle on the north rim. I knew I would enjoy the terrain and challenge of the assignment, but spending some time with a group of 14 year old boys was both a challenge and reward. On the last night, the 6 boys slept on two adjoining picnic tables underneath a shelter, hoping that rain wouldn't punctuate our last night. I slept on the ground nearby listening to the rumors and stories coursing through their high school lives and for a moment stepped back to that age as a couple of shooting stars split the only clear patch of sky. Thanks for the adventure Troop 65. I got an unexpected package in the mail today. It was a couple of copies of the April 2010 Smithsonian Magazine. I shot some work for them last summer, and though I knew it at the time, it's taken a while to go through to print. The story "All-American Monsters" is written by Richard Conniff and is on America's fascination with the mammoths. I didn't know it until meeting him at the Mammoth Site in South Dakota, but many Americans at the time of Thomas Jefferson were convinced that we would find these animals alive and roaming on this continent. It was really great to get it in print from them in the mail. So few times do I get my first viewing of the layout in print. I really like the work that they do and am excited to shoot this assignment. A few weeks ago I shot some portraits of Hearts for Hooves director, Veronique Matthews, for Hemispheres Magazine. Hearts for Hooves provides animal therapy primarily with miniature horses to those in need. Hemispheres is the inflight magazine for United Airlines. They will also be using some images of mine for an upcoming profile on Austin. Despite the winter weather we're having in Austin, we were able to find a beautiful winter day. The ranch out in Lockhart sits atop a hill and was a wonderful location to work with. I brought a lighting setup, but ended up shooting with the fantastic natural light to keep the production more intimate and improvisational. The portrait will run in the April issue of Hemispheres Magazine. WEND is featuring a selection of nightworks of the Colorado Plateau in their SNAP gallery this month. WEND is a great magazine that keeps its adventure storytelling authentic primarily through engaging first-person narratives. They're based in Seattle and also have a strong commitment to environmental ethics as a business. I shot some images at the Mammoth Site in South Dakota for SMITHSONIAN MAGAZINE via Aurora Photos, my photo agency. The story will be published in April 2010, so it will be a while with images. It was the last week of the summer season for a volunteer team to assist with the perpetual dig. The sit is of a prehistoric sink hole where young (primarily male - read into this) mammoths ventured to the watering hole to riskily and never returned. Modern man thanks these young males for their sacrifice to our cultural and scientific knowledge machine. The drive from Salt Lake City (from the Outdoor Retailer Convention) through Wyoming to the Badlands was long, but spectacular. On the return I camped in Ogalla National Grassland, a beautiful, beautiful place. The image above is from there. CANOE & KAYAK recently ran a feature on The Texas Water Safari, self-billed as the "Toughest Canoe Race in the World". The 260+ mile canoe race has been going on since the 1960s and takes place in the summer. I shot the images during the 2007 race with balmy temperatures above 100 degress. 2008 was one of the lowest water years on record and I heard the race all the more challenging in low water. Only 53 of the 100+ teams finished in the allotted time. The story is available online here. CANOE & KAYAK ran its Heroes issue in March and used some images that I shot at last summer's Outdoor Retailer show. It was a great shoot as I had to set up a temporary studio with 20' wide seamless and multiple strobes prior to start of C&K's anniversary party. There was about 20 athletes that we initially shot as a group and then broke them down into smaller bunches. I really enjoyed working with this group as there were some great group dynamics in addition to all of them being stellar athletes. I broke down the studio into a smaller setup and did the 'party photobooth' gig as everyone had a great time. Outside ran a double page spread of one of my wilderness nightworks images in the Exposure section of the October issue. I shot it on a week long shoot on the Colorado Plateau last January. This project is still in development so stay tuned for further news. The September issue of National Geographic Adventure is out with a spread from the Texas Water Safari. It's a shot of the winning 6-man team right before they exited the Guadalupe River for the final 3 mile stretch across the bay. The image was shot at 11:30pm under a near full moon. I drove for a few hours (thanks Joey) to catch up with the leading team at the finish line. Arriving early, I found that their was an old wooden bridge that could make for a good vantage point during their last stretch of river. I arrived, setup, swatted off mosquitos, and had about 5 seconds to catch them with the flash before they were out of range. 260 miles in the June Texas heat. The course runs from San Marcos to the Gulf and is not too technically challenging, though there are some spillways, old cotton gin dams, alligator gar, crocodiles, and other buggers. In addition to stills, I shot video for the Texas Film Syndicate for an upcoming film about the race entitled Hard Water. The New York Times wrote about the race last yearhere. 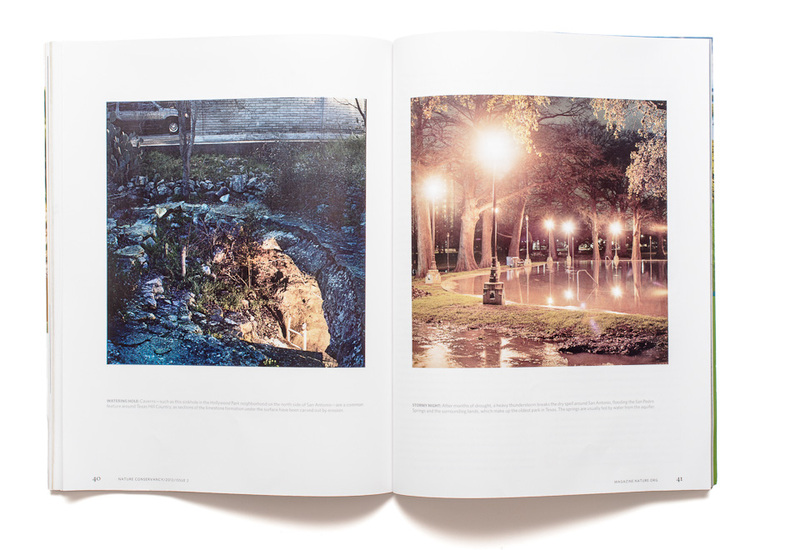 The 'Nightwalks' work was recognized by PDN (Photo District News) in their 2008 Photo Annual. The Nightwalks project developed through an exploration of Austin between 2am and 5am. The sense of the city was so different from what is commonly observe that it renders a different place entirely. Instead of traveling to visit somewhere by plane or car, why not go by time? It is work I'm continuing to develop and use an investigative tool of place. The 2XtM (To Cross the Moon) expedition is a group of three young, yoga-inspired athletes (the YogaSlackers) snowkiting across North Dakota to demonstrate the potential for wind energy. I joined their expedition for five days to photograph their trip. I never knew North Dakota was so beautiful. A story on their expedition is in the June issue of Outside Magazine. They have also setup a web gallery here.